The Universal Playbill Binder, above, is only available at www.playbillstore.com. Photos from www.playbillstore.com. Theatre-going, playbill hoarders don’t have to be packrats anymore – not as long as there are playbill binders in the world. Sure, playbill-collecting is a nice hobby. There is the first blush of excitement after seeing and enjoying the latest thing on or off-Broadway. The desire to have such a strong, visual reminder of the experience is understandable. They can also serve as a quick and handy reference if one is curious about, say, what Lin Manuel Miranda did before “In the Heights." But all of those playbills, like The New York Times arts section, become unwieldy and take up a lot of space. In cities like New York and Tokyo, that is a potential health hazard. 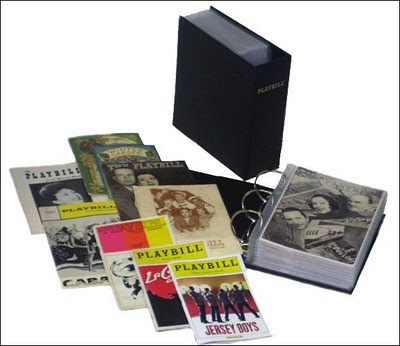 The Basic Playbill Binder is a sort of starter kit for newbie/sometime theater-goers. A playbill binder is a great way to tidy up and organize that collection. At http://www.playbillstore.com/, there are three choices and a bonus on sale during the holidays. 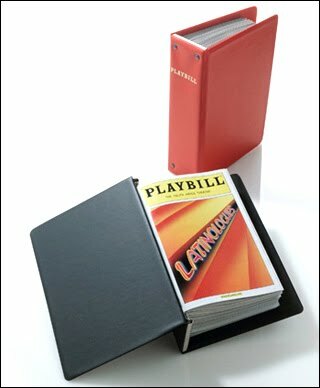 Occasional theater-goers may wish to start with The Basic Playbill Binder ($13.50) http://www.playbillstore.com/binders.html in red or black. Metal rods hold the playbills in place, and the binder accommodates contemporary-sized playbills only (5 3/8” X 8 1/2”). Theater devotees have two choices. 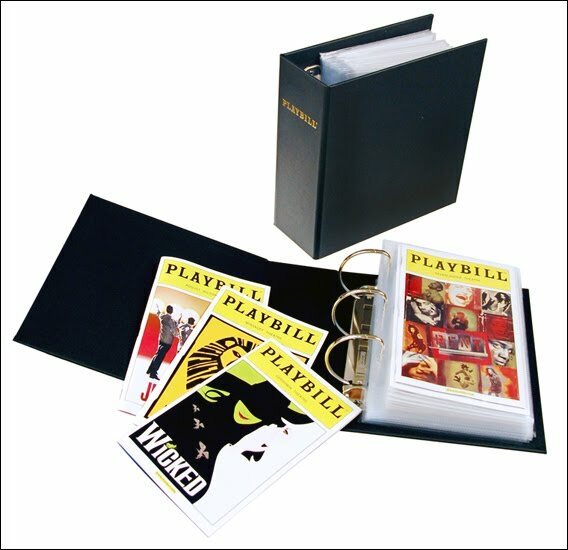 The Ultimate Playbill Binder($32.95) http://www.playbillstore.com/neulplbiarqu.html comes in black. It, too, holds only contemporary playbills. They are held in place by a custom-made three-ring binder. The Universal Playbill Binder ($36.95) http://www.playbillstore.com/neunplbiarqu.html is available exclusively at www.playbillstore.com. It’s available in black only. Binders (in the Ultimate, too) are covered with some of the best book paper available. Playbills from all eras, up to 6 ¾” X 9 ¼”, fit with ease. Archival quality materials in both Ultimate and Universal binders ensure a very long life for the “The Merchant of Venice” with Al Pacino and other precious treasures. The Complete 2009-2010 Broadway Season Opening Night Playbill Collection contains 39 playbills and some extras. Speaking of treasures, “The Complete 2009-2010 Broadway Season Opening Night Playbill Collection PLUS Two Ultimate Playbill Binders” ($250) http://www.playbillstore.com/all39opniplf.html contains the 39 playbills from the official opening night of the shows from the current Broadway season and, two of the aforementioned Ultimates.